Curveballs are inevitable in life. When we least expect it, unfortunate events surface and we are forced to deal with them head on. Many times these occasions are difficult to overcome or even rationalize. Corey Farrow is well acquainted with these curveballs. He has had class sessions in the school of hard knocks and has learned valuable life lessons that have propelled him into a space he occupies now. 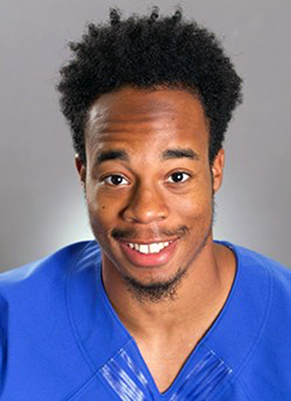 Farrow is a running back at the University of West Georgia (UWG). In his first football game seeing extensive action, the team faced Fayetteville State. Farrow rushed for 31 yards, including a 21-yard scamper, nearly notching his first touchdown as a Wolf. A few months ago the idea of playing football was not feasible to him. Farrow was well on his way in his football journey as an athlete for Shiloh High in Snellville, GA, where he played multiple positions for the Generals. Though Farrow did not receive any official scholarships, there were several Division I schools keeping close watch on him as an athlete. Farrow eventually went to Starkville, MS, as a preferred walk-on at Mississippi State. The future looked promising for Farrow as he adapted to college life. He was succeeding in practices, but for what he possessed athletically, he lacked in prudence. Farrow struggled to make the right decisions off the field and often found himself indulging in unlawful behavior. The inner battle Farrow encountered was too much for him to handle. These events ultimately forced him to do some soul searching. While reflecting on personal matters, his football quest came to an abrupt stop. Unexpectedly, Farrow was found ineligible by the NCAA for academic issues stemming from high school. This essentially ended his football stint at Mississippi State during his first semester. With a cloud of turmoil revolving around him and his future at Mississippi State in flux, he decided to return home, which he says was best at the time. He returned home to more issues regarding his living arrangements. Eventually, he settled in a basement at the house of a family friend. He found this basement to be a proverbial sanctuary for him. Farrow continued to stay in shape, spiritually and physically, and patiently awaited another chance to play the game he loves. With a hint of divine intervention, he applied at UWG a few days before the fall 2014 deadline. In January 2015, Farrow tried out for the football team in hopes of returning to the gridiron. Despite a strong showing, his efforts were not enough and he did not make the team. Farrow returned for June tryouts with a resilient attitude, but got the same results. That seemed to close the book on his football story. Little did he know there was one more tryout camp in July. Adversity has been a central theme for Farrow, an archrival that he has encountered in various seasons of life. But these adversities have birthed an undying resolve in him, even when the odds are not in his favor, an uncommon characteristic for a 20-year-old college student. Farrow’s road to UWG was strenuous, yet valuable. And if you were to converse with him, he would tell you he is just revving up. He has set his sights on much more than the present. This is just the genesis. “I’ve been through a lot, and I’m not going to mess this up,” Farrow said. I cannot tell you how proud I am of you son! Your struggles precede your triumphs, your challenges are only predecessors to your destiny! So many people are inspired and encouraged by you sharing your story. Love you – keep grinding!!! !